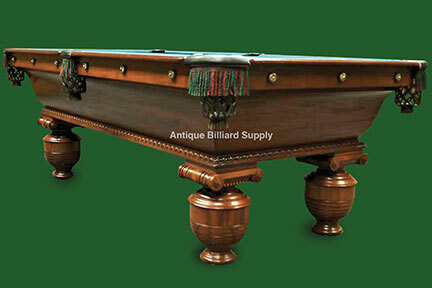 #2-02 Quiet elegance from this antique Brunswick pool table of unusual size. Seldom-seen model constructed of plank mahogany in the late 1800s. Circular legs with beaded moldings and a fluted band above each one. Seven-foot size is perfect for use in an upscale library or game room where space is limited. Rail tops of Brazilian rosewood. Three-piece slate playing surface. Investment grade restoration meticulous in every detail. Ready for delivery.